It is the President of the United States who determines if Gaza will continue to suffer under an immoral and unjust military occupation which is reinforced periodically with invasions and bombardments, actions described by Israeli leaders as “mowing the grass”. With unwavering enforced devotion to the will of the leaders of the modern state of Israel, every U.S. president from Ronald Reagan to Barack Obama, has given Israel what it wants, when it wants it. Earlier presidents—Truman, Eisenhower and Carter—were dragged into Israel’s orbit of control, like it or not, by the growing power of Israel’s control of U.S. public and political opinion. The public is aware that it is the president who makes the nation’s foreign policy decisions. During this election, an Associated Press poll, released August 7, found that foreign policy is no longer Obama’s strong point. “According to the AP poll, only 43 percent of Americans report that they approve of how President Obama is handling foreign policy”. A strong majority disapproved of how he has handled the conflict in Gaza and situations in Afghanistan, Ukraine and Iraq. Polls are only a snapshot of the moment they are taken, but the president’s lack of public support for how he responded to the latest Gaza invasion offers Obama an opening to change his subservient-to-Israel stance. An Atlantic magazine story by one of Israel’s favorite U.S. writers, Jeffrey Goldberg, quoted “a high administration official” using a barnyard epithet to describe Israeli Prime Minister Netanyahu, a slur that brought an immediate outcry from Israel and an apology from the White House. Goldberg is a good example of the symbiotic relationship between the government leaders of Israel and influential U.S. media members. While a student at the University of Pennsylvania, Goldberg, U.S.-born to Jewish parents, was editor-in-chief of The Daily Pennsylvanian. At Penn, according to Wikipedia, Goldberg worked at the Hillel kitchen serving lunch to students. After he left college he moved to Israel, where he served in the Israeli Defense Forces as a prison guard during the First Intifada. Goldberg returned to the United States to resume a journalism career which led him to his current assignment with Atlantic. The Goldberg-provoked diplomatic verbal dance between Washington and Tel Aviv, could not disguise what the Atlantic wanted to reveal; there is little love lost between Obama and Netanyahu. Only recently, Israel’s defense minister visited Washington where he was denied a visit with Obama, Vice President Joe Biden, or Secretary of State John Kerry. This is a White House showing regret for its robotic repetition of the Israeli-dictated mantra, “Israel has a right to defend itself”. Regardless of which party controls the Senate (or by what margin the House keeps its Republican control) the next two years are open to President Obama to act independently of Israel’s control of U.S. public opinion. The president faces no future election before he ends his second term in January, 2017. He is now free to take executive steps to address the evil Israel continues to commit against the Palestinians in Gaza and the West Bank. It begins to appear that Hillary Clinton will face former Florida Governor Jeb Bush (brother and son of two former Bush presidents) in the November, 2016 presidential election. Obama knows his successor, whether it is Clinton, Bush or some other politician, will take office already deep in the grip of Israeli/American political control. The next two years are Obama’s opportunity to right the wrongs of his previous six years in office, and in so doing, give his successor some daylight with which to function outside the darkness of Israeli control. As a start, Obama can drop the robotic “Israel has a right to defend itself” mantra into the Big Lie trash can. Beginning November 5, Obama could begin his own house cleaning of those Israeli-prone White House staffers who whisper “be nice to Israel” nonsense to him. Then he can stop pretending he does not know about Israel’s big “secret” nuclear arsenal nestled in the desert at Dimona. Acknowledging Israel’s nuclear power base–the world’s fourth largest and growing–will free him to sign a nuclear agreement with Iran, ignoring Israel’s faux fears and protestations. He certainly does not need to serve any longer as Israel’s big brother at the United Nations. Israel’s conduct this summer in Gaza provides Obama with an easy rationale to make that policy shift. Free from Israel’s internal U.S. control, Obama will be able to instruct his UN delegation to support Palestine’s admission to that body and its admission as well, to the International Criminal Court. In short, no more automatic pro-Israel UN vetoes. Jimmy Carter once telephoned Menachem Begin to tell the then Israeli prime minister the U.S. would withhold certain funds unless Begin kept an earlier agreement. Begin caved. Such a threat from Obama, who, like Carter, would be prepared to enforce, would do wonders to the lack of moral fiber in Israel’s attitude toward occupation. The rebuilding of Gaza could proceed under an Obama “Israel-free era” without Israel taking its usual heavy slice of the rebuilding profits. Along with the rebuilding agreement would be an Obama-enforced U.S. insistence that any attempt at a fourth Gaza “mowing the grass” invasion would automatically cut off the annual $3.5 billion grant from U.S. tax payers. Finally, let us have no more phony peace process discussions. Instead, the U.S. would impose an agreement that would begin with the green line and end with the elimination of the check points within the Palestinian territories. Palestinian political prisoners should be set free. Their freedom must not continue as hostage to the unworkable peace process. President Obama has two years left in the White House to implement the Obama Doctrine. His actions would provide energy to a growing college student movement to support Palestine freedom. College students around the world could catch fire from the Obama Doctrine and from the example set by universities like Exeter in southwest England who have just voted “overwhelming in support of a boycott of goods produced in illegal Israeli settlements”. Eighty-six percent of the student body at the University of Exeter, the largest voter turnout in the history of the university, endorsed the boycott referendum. The video below further documents the necessity of such a shift in U.S. foreign policy toward Gaza, Israel and the West Bank. The video (four minutes), produced after this summer’s invasion, is by the Palestinian video company, Mediatown. It offers a contrast between what Gaza had been prior to Israel’s post-2006 invasions, and what a free Gaza could become once again. 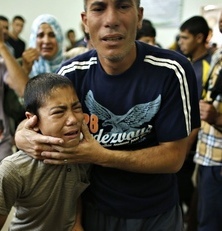 The picture at top of the aftermath of an August, 2014, Israeli bombardment of a Gaza compound is from The Guardian. It is a Reuters photo taken by Mohammed Salem. 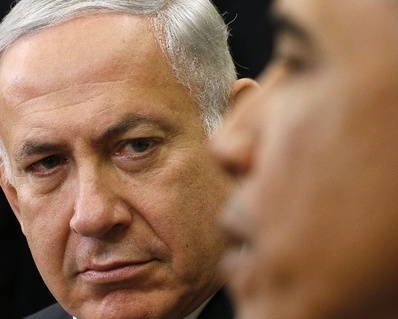 The Netanyahu-Obama picture is by Reuters. It ran in the Atlantic. The video is from Mediatown. This entry was posted in Gaza, Hillary Clinton, Iran, Israel, Jeb Bush, Middle East, Middle East Politics, Netanyahu, Obama, Palestinians. Bookmark the permalink. 10 Responses to What Happens In Gaza After The U.S. Elections? Jim…I think Kissinger said.”People have rights.. Nations have interests”. If Henry the K. didn’t say it, he should have, because it is an accurate statement. .As Israel continues to bellow,” We have a right to..”.etc.they get away with it because the difference between rights and interests is unseen by most people, because they don’t think about it. They would consider,it, if they thought about it to be a distinction without a difference. How convenient — for both the Israel and American governments, and their backers..
It’s interesting to speculate how the many organizations in this country – both faith-based and secular – committed to ending the Occupation and seeking a just peace might mobilize to encourage and support an Obama Doctrine that, at last, ended our complicity with Israel’s oppression of the Palestinian people. Jim, I would vote for you for President. Obama could pull it off, but it seems out of character. At the IPMN (Israel Palestine Mission Network, of the Presbyterian Church), Annual Meeting held in Chicago last weekend, someone said Israel-Palestine is the premier injustice situation in the world, because, for example, if Iseael gets away with what it is doing to the Palestinians every other repressive regime or dictator or monster that arises can say, well they did it so we can too. I was struck by this comment because it helped me see what I’ve been feeling, namely that Israel Palestine and global warming, jusr ri rhrow rhat in, are kind of on a par in signaling the kind of terrible and inhuman place the world seems hell-bent on becoming. Would that Pres Obama will read your statement, clench his fist in the air and shout “Yes! I can!”, and roll up his sleeves! But maybe it’s good to have a plan B ready, you know, just in case. Jim, your elegant rumination is a prescription for sanity in U.S. foreign affairs and the accompanying domestic machinations. Unfortunately, there is and can be no sanity, because certifiable psychotics control the USraeli asylum with an ever-building and -entrenched frenzy to have their criminal, bullying way. Please flag this blog and run it again in January 2017 as an annotated scorecard: an after-assessment of what was vs. what might have been. You make it sound as though our Prexy has a free hand to threaten our friends over there. Congress has had some say in mandating the $3.1 military and economic aid to Israel and would have a fit if B.O. threatened a different direction. Here is what you said: “Jimmy Carter once telephoned Menachem Begin to tell the then Israeli prime minister the U.S. would withhold certain funds unless Begin kept an earlier agreement. Begin caved. Hmmm. No one sounds very hopeful. I certainly agree that breaking the “inseparable bond” Israel has forged with our Congress is not likely. And I agree that Obama will not want to jeopardize Democrats in 2016, but can’t we find some way to at least make both Congress and the administration uncomfortable … and begin to feel ashamed of our complicity? Jim: You have posted an appealing de-marche. With the standoff recently launched by Sec State and Obama’s recent refusal to meet with Israel’s defense secretary, we appear as close as we are likely to be anytime soon to a frame of mind for delivering your message. Jim, You have written abundantly excellent articles every week for a very long while, now. BUT, THIS IS ABSOLUTELY BRILLIANT!!!! It is time to start a campaign – and you have, effectively, just launched it: To say to mainstream America that Congress is wearing no pants. OK, no clothes. It is foreign country, Israel, that wears our own pants in our own country. My take over the past couple of decades, in particular, is that Israel has steadily and falsely, persuaded mainstream America, media, churches, politicians, entertainment industry, that “American and Israeli interests are one and the same”. Al Qaida sealed it with a kiss for Israel in its savage attack of 9/11. No wonder that some Israeli leaders openly exclaimed that the tragic event was the best thing that happened to Israel ever since its creation in 1948. THIS is precisely what we need to start feverishly working on: to show mainstream that American interests are not only different, but often contrary to those of Israel’s”. We need to educate mainstream – through social media – what are these differences and how they damage and destroy American interests in the entire region of the Middle East, Asia, Africa, Europe, and Latin America. I realize that this is easier said than done, but we need to start somewhere. The BANNER for this effort should be one that highlights the primary joint Arab-American interests in the fields of geo-political strategy, energy, politics, military, culture, education, and most certainly in the areas of achieving justice, peace, and harmony in the Holy Land.